What is involved in Competition Obedience? 3 legs are required to earn a CD  CDX & Utility titles. This means the dog and handler must compete in the ring 3 times under at least two different judges. A perfect score is 200, A minimum score of 170 must be achieved to qualify & earn a leg. 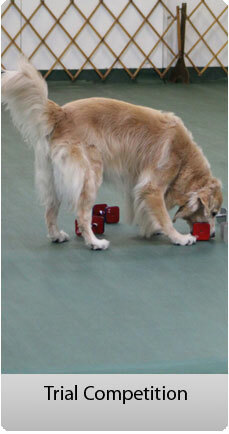 Dogs must qualify in each exercise, and will not earn a leg if they fail any of the required exercises. In standard classes there are three levels of competition: Novice in which the dog and handler compete towards their Companion Dog Title (CD), Open in which the dog and handler work towards their Companion Dog Excellent Title (CDX) and finally Utility which when complete gives them the Utility title (UD). The title for each level must be earned before the dog and handler pair can compete in the next level. Most dogs are 4-5 years of age by the time they are competing in Utility. It takes time and dedication to train to this level, but the teamwork and bonding that is built thru this process is beyond what words can describe. Obedience is a very rewarding hobby, and communication with your dog is at an all time high.